"It was a very worthwhile trip, and I learnt a lot." University Prof. Ryoji Noyori was talking about his first visit to Uzbekistan, as he waited at Incheon Airport for his connecting flight to Japan on September 1st. Noyori fitted this trip into his busy schedule at the request of the Uzbek government, through exchange students studying at Nagoya University. This was the first visit to Uzbekistan by a Nobel Prize winner, and he received a warm welcome everywhere he went, giving lectures, talking to young researchers, and meeting leading figures in government and education as part of his packed itinerary. Uzbekistan was once a global academic center, conducting advanced studies. It has a strong relationship with Japan, since Japanese prisoners of war were detained there at the end of the Second World War. As he had an opportunity to visit these associated places, his whistle-stop three-day trip seemed to have made a deep impression on him. 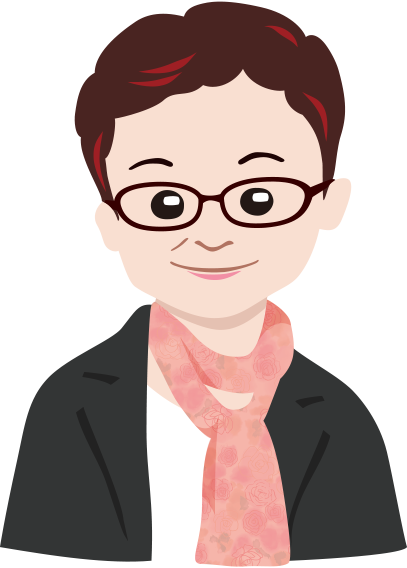 "I really felt the enthusiasm of a young country trying to grow, and the passion of its leaders," says Noyori. In contrast, Japan has long since lost this youthfulness, and the trip renewed his sense of crisis about the situation in Japan, where academia seems to be in decline. Accompanying him on this trip, I thought that the present strong ties between Meidai and Uzbekistan has these historical background and also felt that the future will be forged by the young people inspired by the words of a Nobel Prize winner. Thinking in terms of the axis of time, I believe Noyori's trip was a historical event. Noyori first gave a lecture to students, researchers and educators entitled "Where am I from? Where are you going?" at the Japan/Uzbekistan Symposium in the capital city, Tashkent. In the first half, starting with an image of Kobe destroyed in the war, he talked about his childhood as a shy boy, being inspired by the Nobel Prize of Dr. Hideki Yukawa to pursue a career in research, and how he was awarded a Nobel Prize for his research into asymmetric synthesis. In the second half, he talked about how technology created by science in the pursuit of truth has on the one hand brought benefits such as extending human life and improving our lifestyles, but on the other hand has led to problems such as environmental destruction on a global scale and the adverse effects of globalization, so new wisdom is required for the future of mankind. In the first half he mentioned the global scholars in Uzbekistan's past, and in the second half he talked about Uzbekistan's cooperation with Japan and the current educational reforms in the country. He said that youth is a kind of strength of Uzbekistan, where 42% of the total population of 32 million are aged 24 and under, and entrusted hope to the young audience. Compared to Japan, where people of 65 and over now make up an unprecedented 28% of the population, Uzbekistan's population is strikingly young. Noyori ended his lecture by appealing to the leaders, saying that "freedom is really important for academic research." The lecture seemed to make a strong impression and his words encouraged the young people. Being told that they too could win a Nobel Prize inspired confidence, and some of the attendees commented that they would like to be able to talk like Professor Noyori when they reached 80 years of age. 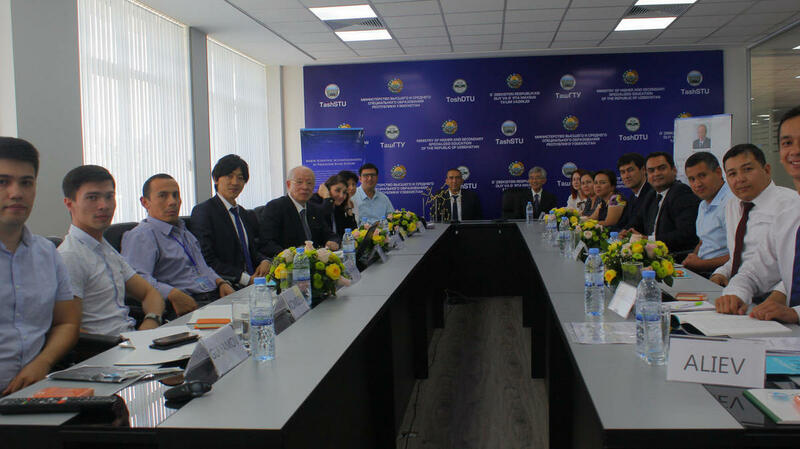 After the lecture, Noyori joined young researchers at Tashkent State Technical University for a roundtable discussion about innovation, lasting almost two hours. 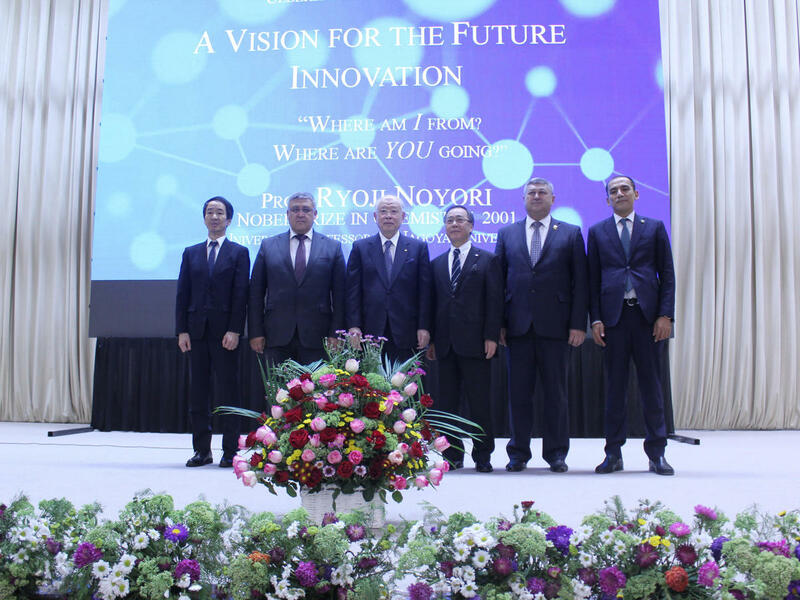 Along with University President Seiichi Matsuo who accompanied him on the trip, he met with Uzbek government ministers including Deputy Prime Minister, Aziz Abdukhakimov, Minister of Higher and Secondary Specialized Education, Inomjon Majidov, and Minister of Innovative Development, Ibrokhim Abdurakhmonov. The 48-year old Deputy Prime Minister, who received a master's degree from Hitotsubashi University and is proficient in Japanese, spoke enthusiastically about the educational reforms currently underway, and the country's innovation policies. One major issue is increasing the university entrance rate, which is currently less than 10%. Uzbekistan is proactively inviting branch schools of overseas universities. Eight Russian universities and three Korean universities have already opened branch schools in Uzbekistan, and talks are being held with Italy, France and Singapore. Discussions are also underway with 49 universities around the world regarding establishing undergraduate and doctoral courses. Deputy Prime Minister Abdukhakimov encouraged Japanese universities to consider opening branch schools in Uzbekistan. Meidai has the deepest relationship with Uzbekistan of any Japanese university, with exchange programs going back 20 years. Starting from the legislative assistance requested by Uzbek scholars, Research and Education Center for Japanese Law, Center for Asian Legal Exchange (CALE), allowing students to learn Japanese law in Japanese, opened at Tashkent University of Law in 2005. As part of the MEXT Global 30 Project, in 2010 Meidai established an overseas office in Tashkent to be shared by Japanese universities. 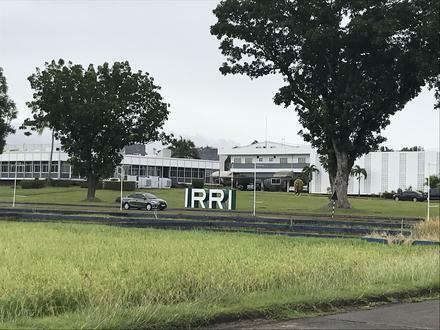 The Asian Satellite Campuses Institute was established in 2015, as part of the University's program allowing professionals to obtain a doctoral degree while working. When Japan's Prime Minister Shinzo Abe visited Uzbekistan in 2015, he and the then President Islam Abduganiyevich Karimov agreed to create the UZBEK-JAPAN Innovation Center of Youth at Tashkent State Technical University, and Meidai has played a central role in the preparations. Over 70 Uzbek exchange students have studied at Meidai, and there is an alumni association, who held a welcome party at the end of the busy day in Tashkent. 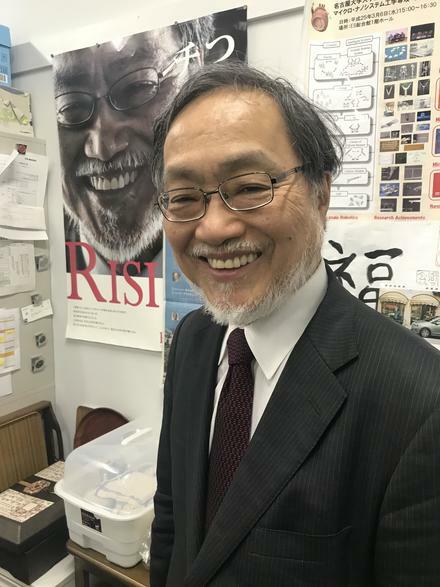 "It is exactly 50 years since I joined Meidai as an associate professor from Kyoto University," smiled Noyori, looking relaxed surrounded by his juniors. Plaque on the side of the Navoiy Theater, describing the contribution of Japanese people. 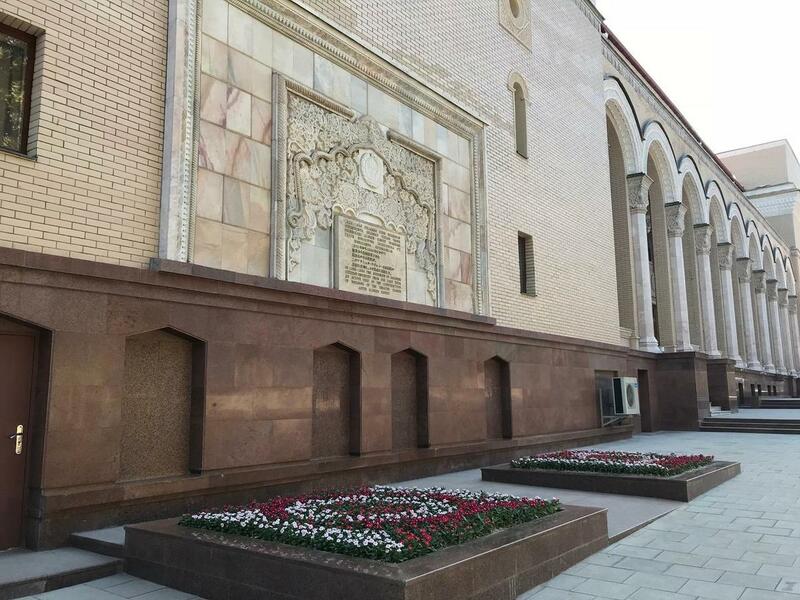 When talking about Japan's involvement in Uzbekistan, one thing that is always mentioned is the Navoiy Theater, a ballet theater in Tashkent with a 1400-seat capacity. It was completed in 1947 under forced labor by Japanese detainees transferred there after the end of the Second World War. The Japanese workers had a reputation for diligence, and local people apparently supplied them with food, for instance. When most of the buildings in Tashkent were destroyed by a huge earthquake in 1966, this building alone remained standing, winning further admiration for their solid building work. Having the opportunity to visit this theater for the first time, I was shown a plaque on the outside of the building. In Uzbek, Japanese and English, it reads: "In 1945-1946 the hundreds of Japanese citizens deported from Far East took an active part in the construction of building of the theatre named after Alisher Navoiy." Apparently, it says "Japanese citizens" because they were not detained by Uzbekistan. This plaque was installed in 1996, soon after the country gained independence in 1991, and was the idea of President Karimov, who had seen the Japanese detainees as a child and often talked about his feeling of gratitude towards them. Entering the brick building, I was overwhelmed by its stateliness. I felt much moved, wondering what those detainees thought as they built it brick by brick under harsh working conditions. It is estimated that around 560,000 Japanese prisoners of war were detained in the former Soviet Union, and 25,000 of these were sent to Uzbekistan. As well as the theater, they were involved in the construction of canals and dams, and in farm work. About 800 people died during the detention, but the death rate was less than half of that in Siberia, largely due to the huge difference in the environment, including the climate. I visited the Japanese cemetery in a corner of the huge cemetery in the city. 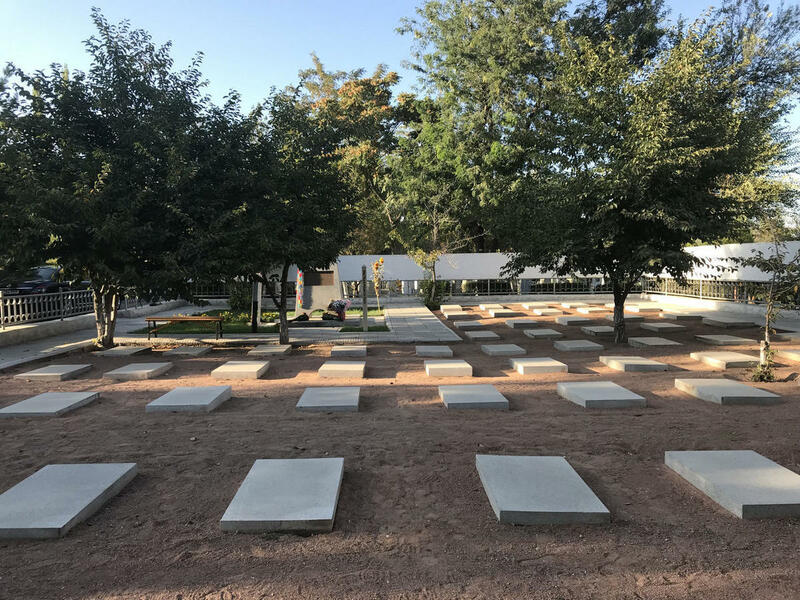 The names and hometowns of 79 people are engraved on the gravestones where they are laid to rest, watched over by cherry trees. In the neatly-maintained cemetery there was also a monument dedicated to people who died elsewhere in Uzbekistan. I was surprised to find a "Japanese Detainees Museum" next to the cemetery. It was founded in 1998 by Jalil Sultanov, who collected information and related goods of the detainees and funded it personally. On display are photographs and letters from the time, as well as items such as a cradle made by the detainees. Sultanov has continued his activities to preserve the memory of the detainees, making documentary films and so on, and was awarded a Foreign Minister's Commendation by Japan in 2015. As I visited these places, I realized that the fact that these detainees worked their hardest on the construction work despite their terrible situation has probably led to today's relationship of exchange between the two countries. Without this, a party from Meidai would probably not be visiting a distant Central Asian country like this. Eldorjon Elmurodov, Deputy Director of Meidai's Uzbekistan Office, is another person who grew up hearing stories about these detainees from his grandfather and father who were fans of the Japanese. After graduating from the University of World Economy and Diplomacy in Tashkent, he studied for a master's degree at Meidai's School of Law. After joining the Foreign Ministry and serving at the embassy in Tokyo for four years, he moved to the Meidai office in 2015. As well as running various programs, he is also researching NPOs. However, there are fewer and fewer people who have experience of meeting the detainees or hearing about them, so inevitably these memories will fade. The pro-Japan former President Karimov died last year. "Bridge to Uzbekistan," a collection of articles about Uzbekistan published by Meidai's International Education & Exchange Center in 2016, includes a report by Kengo Kokubo who had a short stay in Uzbekistan (1st year, Faculty of Science). He did a survey of young people in Uzbekistan, and found that most of them did not share memories of the Japanese detainees. Overall pro-Japanese sentiments of the past have increased interest in Japan, leading to the popularity of manga and anime among the younger generation. Connecting past heritage to the future in new ways: I think this is what is required of future generations. Another impressive attraction is the Ulugh Beg Observatory, built by the 15th Century astronomer mentioned in Noyori's lecture. It is in Samarkand, 350km southwest of Tashkent -- about 2 hours by high-speed railway. Ulugh Beg was the 4th emperor of the Timurid dynasty which brought prosperity to Central Asia, and Samarkand, a hub of the Silk Road, thrived as a cultural center. Many astronomers gathered at the observatory in those days to observe the sun and stars. They measured the length of the solar year so accurately that their measurement is within one minute of the current figure. Their charts plotting the observed position of the stars were considered to be the most accurate in the world for about 200 years, until the work of Kepler. In Registan Square, an impressive blue-tiled commercial center, is a religious school called Ulugh Beg Madrasah, which accepted students from all denominations, not just Muslims. "Ulugh Beg used the profits from trade to fund research, and shared the results across religions and across countries, so he was hated by those in power," says our guide Saida. As a result, he met a tragic end, being killed by his own son who was tempted by his surroundings. The observatory was destroyed after his death. 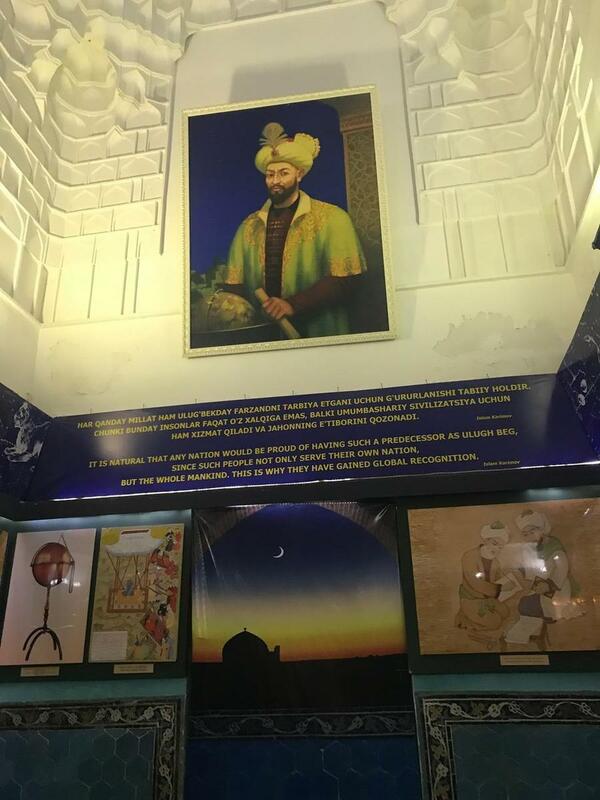 The underground part of the observatory was excavated during the Soviet era over 400 years later, and investigation of his tomb found that Ulugh Beg was beheaded. It is clear that Ulugh Beg valued studies above all else. In any era, ideas that are ahead of their time are often hard to accept at the time. I recall Alfred Nobel's will about Nobel Prize. As he clearly stated that the prizes should be awarded "regardless of nationality," many people got upset that it was unpatriotic, and the king initially refused to attend the award ceremony. "In science there are no national borders, and no walls of religion. He spent the money he earned for science and educating young people." Gazing at the remains of the observatory, Noyori was struck by the fact that such a person existed in the 15th century. While walking around the ruins in Samarkand, we had an unexpected encounter. When we visited the museum on the hill of Afrasiyab, which was destroyed by Genghis Khan, Prof. Ilkhom Tuxtasinov, Rector of the Samarkand State Institute of Foreign Languages, was waiting for Prof. Noyori. He had seen a television program about the professor's visit the previous evening and found out that he was going to Samarkand, and went to the museum in order to welcome him to Samarkand. A delegation from Meidai visited his university last year and the Rector and students begged Meidai to send a teacher, saying that although Japanese was a popular language, they did not have any Japanese teachers. After that, Tomoko Terada, special lecturer at Research and Education Center for Japanese Law in Tashkent, went to teach at the Samarkand State Institute of Foreign Languages for seven months, so he must have wanted to show his gratitude. Although he was from a different field, he showed respect for the great researcher and for Meidai, as well as pride in the traditional area of Samarkand. Once again, Noyori was amazed by this enthusiasm. This trip was a chance to spread the wings of imagination beyond time and space. I think one of the key words was "academia" as mentioned by Noyori. That is, the universal power of academia to connect people together. Heading into the future, what should we do, or what can we do, to grow new shoots in the land, and what will we learn from this? There must be things universities can do and that are only possible because we are a university. It goes without saying that before we can do this, we must increase our own academic abilities. We made our way home carrying this weighty challenge. 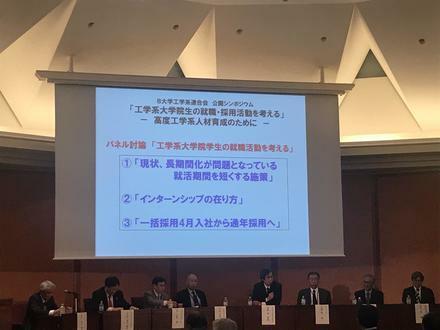 The views and opinions expressed in these articles are those of the author and do not necessarily reflect the official position of Nagoya University. All text, photos, videos, and other content on this website are protected by copyright, patent, or other rights owned by Nagoya University or authorized for Nagoya University's use by the legitimate rights holder. Text, photos, videos, and other content on this website may be displayed, reproduced, printed, etc., for personal use only and may not be reproduced in an environment accessible to third parties nor be used for commercial purposes. In such cases of personal use, content must not be altered. Moreover, even when this content is used solely for personal use and not reproduced in an environment accessible to third parties or used for commercial purposes, any and all descriptions of copyrights, etc., must not be deleted. Nagoya University assumes no responsibility whatsoever for any and all disputes, damages, etc., arising from the reproduction of this content. Copyright © Nagoya University All rights reserved.